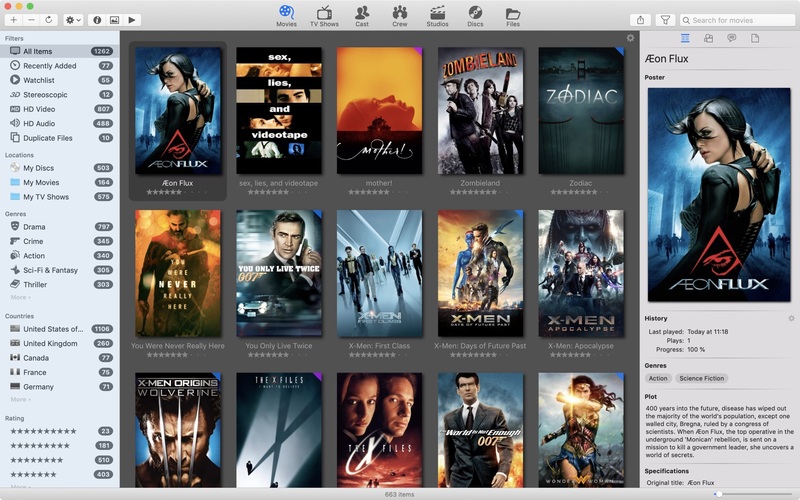 Movie Explorer Pro 2.0.2 – The ultimate movie catalog app. Movie Explorer scans all your internal, external and network drives for digital movie files like MKV, M4V, AVI and MP4 and saves them in a movie catalog for off line browsing and searching. The app can be used as a convenient starting point for playing your movie files by using the ‘Play’ and ‘Play with’ menu commands. The ‘Gallery’ feature let you enjoy posters, stills and photos of movies, cast and crew members. Maps your digital movie files automatically with movie metadata provided by The Movie Database (TMDb). Reads technical metadata of your files using the MediaInfo library of MediaArea. Shows details like the original title, plot summary, release date, rating but also information about the cast, crew and studio. Displays technical details like encoding format, bit rate, video format, resolution, bit depth and audio specifications. Shows movie posters, cast photos, crew photos and studio logos of your movie files. Shows your movies as thumbnails, grouped by cast members, crew members or studios, or just as files. Support for TV Shows. This is an In-app purchase within the app. Episodes, seasons, shows and movies can be marked as ‘Watched’ or ‘Unwatched’, and can be synced bidirectionally with Trakt.tv (TV Shows Add-on). With the Filter popover menu you can filter on ‘Watched’, ‘Paused’ and ‘Unwatched’, together with the existing filters and search function (TV Shows Add-on). Show the number of unwatched files in the sidebar for all filters (TV Shows Add-on). Thumbnails can be resized from small to extremely large. In addition you can adjust the image quality of the thumbnails. All data is saved locally in a database which makes your digital movie collections very easily searchable. You can search on movie title, cast name, crew name (including the movie director), studio name or filename. The ‘Get Info’ context menu gives you all details of your movies, the cast and crew in a fully internally linked fashion. The ‘Open Gallery’ context menu let you browse through posters, photos and artwork of movies, cast and crew. The customizable sidebar enables you to filter your collection on criteria like file location, genres, countries and rating. Handy additional filters for Recently added, Stereoscopic, HD Video, HD Audio and Duplicate files. You can map manually files to movies to correct missing or incorrect movie metadata. Each movie file can be opened with the associated app by double clicking. By using the ‘Play with’ context menu, you can choose manually an app for playing a selected movie. Each movie, cast member or crew member can be investigated in more detail in IMDb, utilizing the built-in link feature. Let you open homepages of movies, cast and crew members. Export movie data on file location level to a CSV file. Next story Delicious Library 3.8.3 – Import, browse and share your media. Previous story Get Backup Pro 3.4.10 – Powerful backup, synchronization, and cloning utility. Rottenwood 1.0.9 – Catalog your movies.